This is what I tell myself when I’m in the middle of a tough run, defending myself in a dispute, or getting anxious about my startup and our progress. I think about how great it feels once I’ve pushed through the pain, the fear and the challenge. Accomplishing a goal when I was scared – and kept going anyway – is a reward like no other. Keep going! You have to go through the challenge to get out on the other side – you can’t go around. 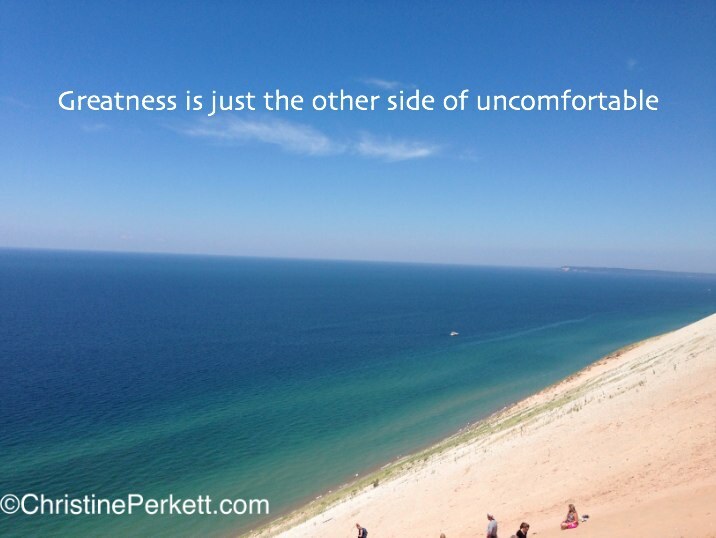 This entry was posted in Business and tagged greatness, inspiration, quotes on July 25, 2014 by Christine. 25) They say business isn’t personal, it’s just business. But when it’s such a major part of someone’s life, it is indeed personal. Remember this both when you’re employer and employee, and act accordingly. 27) Explore before settling down. There’s always time to settle down. 28) Pack light and bring a credit card. 29) Learn to play the guitar. It can bring you solace when you’re alone, entertain a group of friends and warm up a campsite, a party or even a date. 30) Send her flowers for no reason at all. 32) Plan to learn a new skill every year. Even if you never again apply it. 33) Create something with your hands – a tree house, a go kart, a desk, a house… something that will always make you proud when you look at it. 34) Learn how to be alone. 35) Write it down. Visit it again in a few days, months, years… you’ll be amazed at your perspective. 36) Don’t keep up with the Joneses. It’s a boring game that no one ever wins. This entry was posted in 365 Life Lessons, life, Personal and tagged inspiration, life lessons, Mom's Advice, perspective, words to live by on June 6, 2013 by Christine. Being good to yourself is crucial in both work and personal life. If you’re not good to you, no one else will think they need to be. This entry was posted in 365 Life Lessons, life, Personal and tagged #365LifeLessons, career advice, inspiration, life lessons, personal, Thought for the Day on May 2, 2013 by Christine.